It seems we never stop slowing down. Good thing there are some hot new gadgets out on the market out this fall to keep us going and organized. Where ever you go, you can keep the party going. The Lucas audio system boasts itself as the smallest personal amp out there. Weighing less than 25 pounds you can plug a guitar, keyboard, ipod and external speakers all without needing a mixer. The Nano 300 features a dedicated subwoofer + 2 powerful satellite speakers that can be mounted directly on top of the sub with no wiring required. Nothing can be a bigger headache than trying to get files from all of your devices. The I-Flash drive solves that problem. 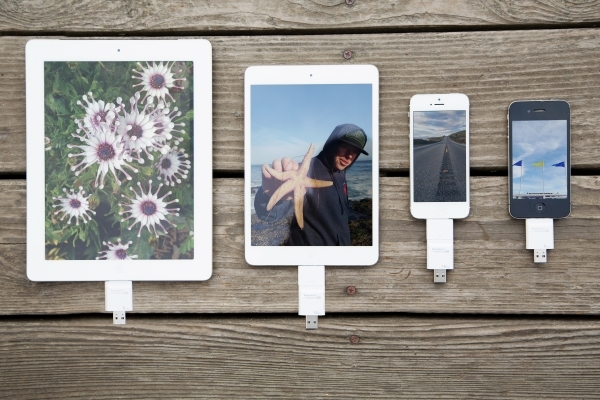 Easily transfer files from your iPhone to your iPad or Macbook in a snap. The Android version offers multi-platform file transfer between Apple products and Android. Save some space and stream anything from any of your devices with the Bem Wireless speaker. About the size of a juice-box the speaker plugs into any outlet, with USB ports to charge your phone or any other devices while you jam out. The Booqpad Mini blends the best of new school and old school. One side of the Booqpad mini keeps your Ipad safe and the other side has a notepad, perfect for doodling. Available in a variety of colors and materials you can keep your Ipad safe and stay organized.